They make the ultimate sacrifice, wherever and whenever needed across the seven seas, defending freedom and upholding the Navy values of valor, honor and glory. Now, you can show your appreciation for all they do with this distinctive fine jewelry exclusive For My Sailor pendant in a dog tag design. This striking pendant necklace bears dramatically detailed symbols and words of honor and arrives in a custom-designed case that includes a sentiment card with the "For My Sailor" poem. This Navy pendant is superbly handcrafted in tough-as-a-sailor stainless steel and features a genuine black onyx stone, framed in stainless steel, strategically placed at the center of a symbolic cross. In sculpted, raised-relief on the black onyx is the U.S. Navy emblem with 18K gold-plated accents. Adding to its special meaning, this Navy dog tag pendant is engraved on one side with "NAVY", and on the reverse side with the Navy values of "VALOR, HONOR, GLORY," and the Navy emblem. You may not protect the front lines or wear the uniform, but the brave men and women of the United States Navy are always protecting us every day. Now, you can show your unwavering pride and the gallant spirit of the Navy with the bold and beautiful Navy Strong Pendant Necklace, a fine jewelry exclusive. Included with the pendant necklace is a heartfelt poem card entitled "NAVY STRONG", making this U.S. Navy women's pendant necklace that much more meaningful. This stunning women's pendant necklace is meticulously handcrafted with sterling silver plating and shimmering 18K gold-plated accents. What's truly unique about this treasure are the 3 rings that roll together, representing the creed that Navy loved ones abide by just as much as their beloved sailors - "Honor," "Courage," and "Commitment". One word from this powerful motto is finely engraved on the back of each ring while the front of the 18K gold-plated ring is also engraved with the sentiment "NAVY Strong". Centered in the trio of rings is a dangling charm of the Navy emblem that features crossed anchors, the stars and stripes of our flag and a majestic eagle. Send them blessings of love and safety with the inspiring St. Michael Military Medallion Pendant. Front side of the pendant features beautifully carved, detailed artwork of that Navy or another military branch logo surrounded by St. Michael Protect Us. On the reverse side, any 3-line custom message you choose is skillfully engraved, creating a memorable keepsake they'll proudly wear through the years. Perfect for his/her birthday, holidays, and/or another memorable time! Show your love of country, and honor the men and women who defend our freedom, with this U.S. Navy crystal heart-shaped pendant necklace. This handcrafted faceted crystal heart has the proud image of an American flag embedded within. On top is a sculpted Navy symbol of an eagle, flag and a crossed anchor in gleaming solid sterling silver with 24K gold plating. Etched in script on the back of the pendant are the words, "Valor Honor." An 18" decorative solid sterling silver chain adds the finishing touch. 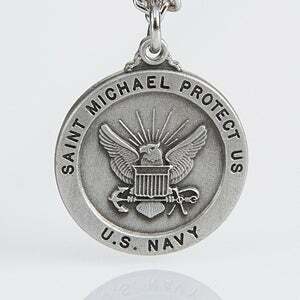 This exclusive United States Navy pendant is a fine jewelry design. It will serve as a patriotic tribute each time you wear it. Pendant arrives in a deluxe velvet pouch and a gift box.